We are among the pre-eminent names of the business, which engages in the manufacture, supply and export of Thread Rolling Machine. Made available in a varied range of specifications, these efficient and functionally fluent machines are extensively sought after. Offered assemblage is tested for its flawlessness, before the final transmission. 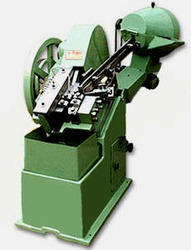 Looking for Thread Rolling Machine High Speed ?